The Memorial Candle Program has been designed to help offset the costs associated with the hosting this Tribute Website in perpetuity. Through the lighting of a memorial candle, your thoughtful gesture will be recorded in the Book of Memories and the proceeds will go directly towards helping ensure that the family and friends of Eunice Zimmermann can continue to memorialize, re-visit, interact with each other and enhance this tribute for future generations. 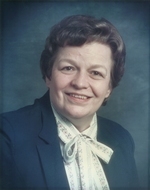 Zimmermann, Eunice C. (nee Malke). Asleep in Jesus. May 10, 1925 to April 7, 2019, of Glendale. Beloved wife of the late Roger C. Zimmermann for 63 years; precious mother of Roger C., Jr. (former wife Karen) and Joan (Phil) Ces; beloved grandmother of Alisha (Oliver) Davis, Mark (Sarah) Zimmermann, and Matthew Ces; dear great-grandmother of Caleb and Jacob Zimmermann; dear daughter of the late E. Bernard and Clara Salzmann Malke; loving sister of the late E.B. “Bud” (Mildred) Malke Jr., Doris (Leslie) Zabel; and the late Robert Malke; dear sister-in-law, aunt, cousin, and friend. Eunice was active in the Glendale Women’s Club, Glendale Historical Society, Holy Cross Lutheran School Alumni, among many others. Services: Visitation at Bopp Chapel, Thursday, April 18, 4-8 p.m. (www.boppchapel.com). Funeral Friday, April 19, 9:30 a.m. at Glendale Lutheran Church, 1365 N. Sappington Road. Interment private at Jefferson Barracks National Cemetery. Memorials preferred to Glendale Lutheran Church.